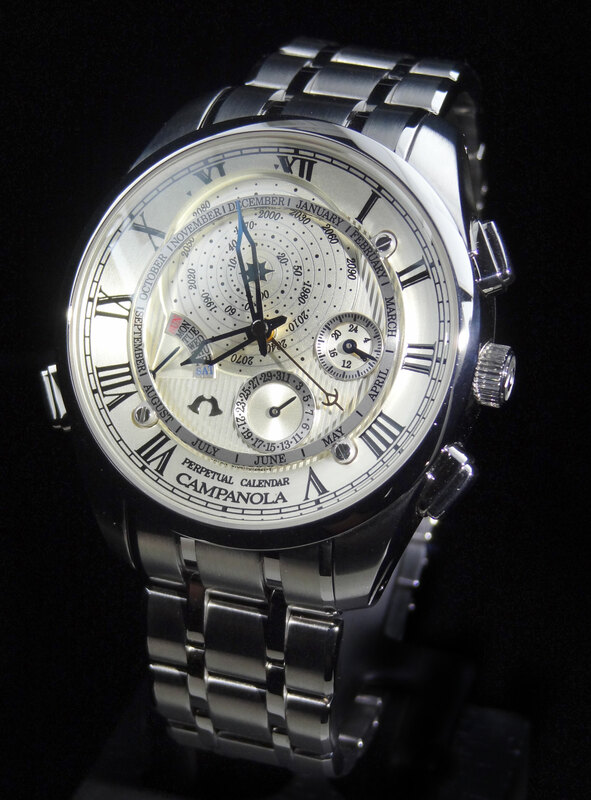 The name Campanola derives from the region of Italy, Campania and the city that lies within, Nola. The legend is, that this was the 1st place to ring a bell in order to mark the time. 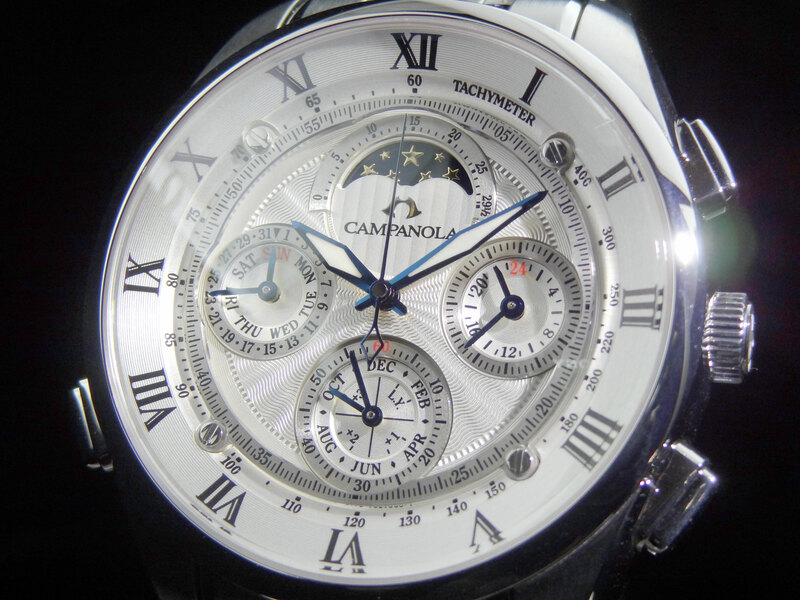 Ironically, Campanola’s are not made in Italy, but Japan, by the finest craftsmen the Citizen Watch Company has to offer. 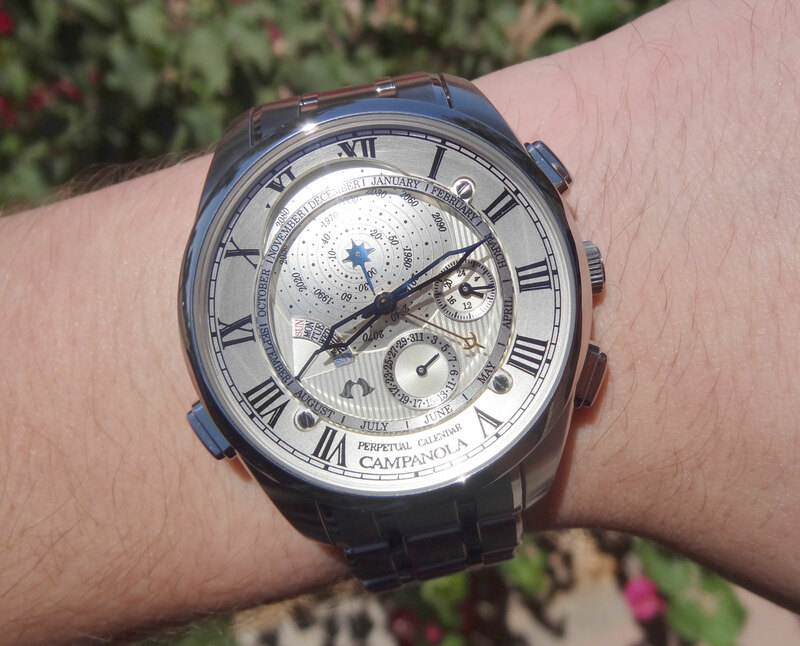 The Campanola Crazy Deal at http://www.AZFineTime.com. With Campanola no longer being available in the states, the guys at AZ Fine Time had to move quick on what was still available. We were fortunate enough to get our hands on 5 different styles and bought everything Citizen USA had left in inventory. 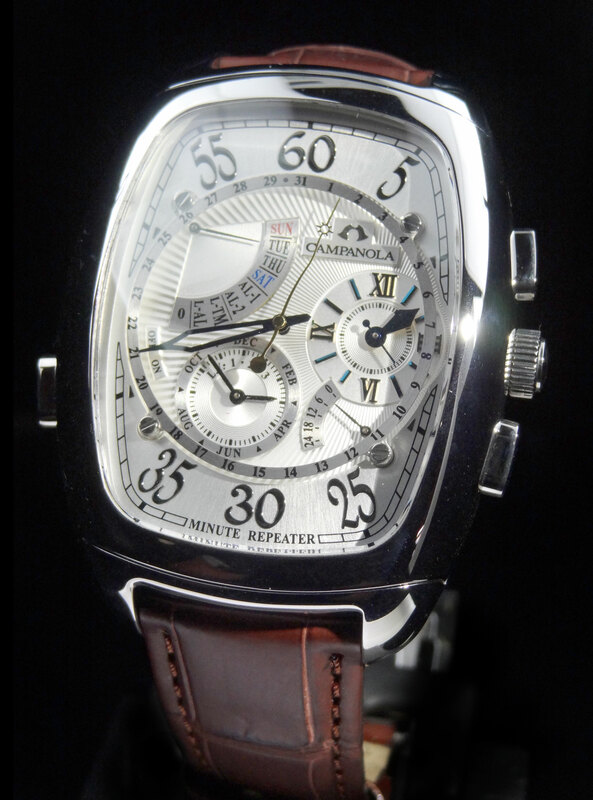 We feel that these very boutique and under-rated watches are going to be incredible collectors items. The value at full retail is incredible alone. 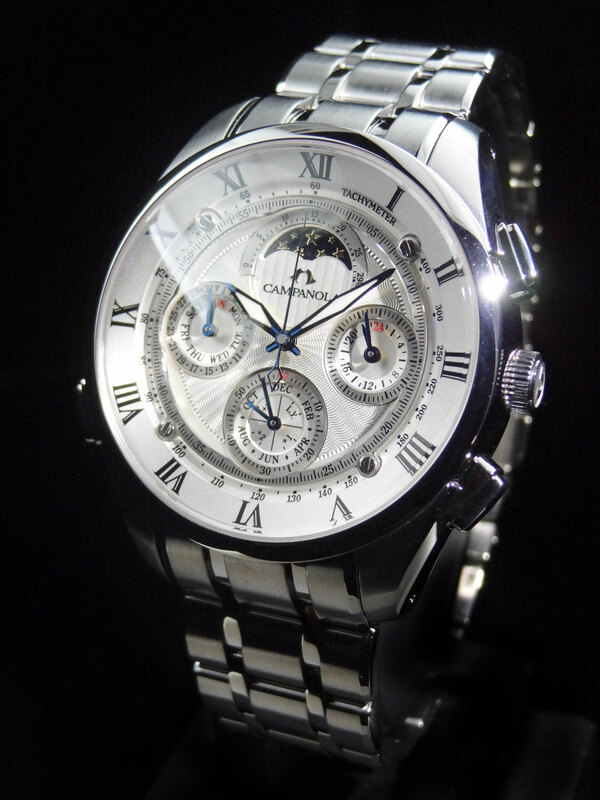 Where else can you find a timepiece of this complication, exquisite finish and unique design for such an amazing price? You can’t. 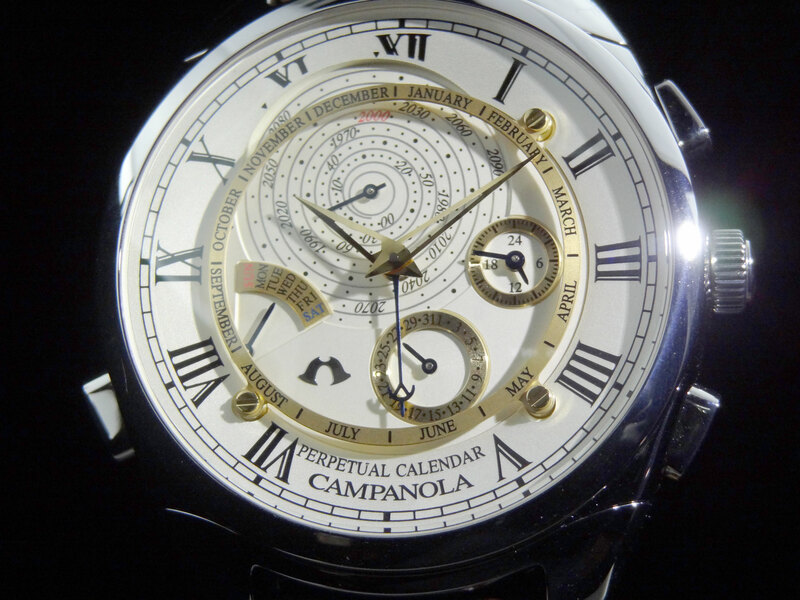 If you take a close look at Campanola as a brand, you will find such features as perpetual calendars, alarms, chronographs, moonphases, and even minute repeaters! While each style has different features, they are all hand built and hand finished quartz movements. This gives the watchmaker the capability of inspecting everything thoroughly and assures everything leaves functioning perfect from the factory. 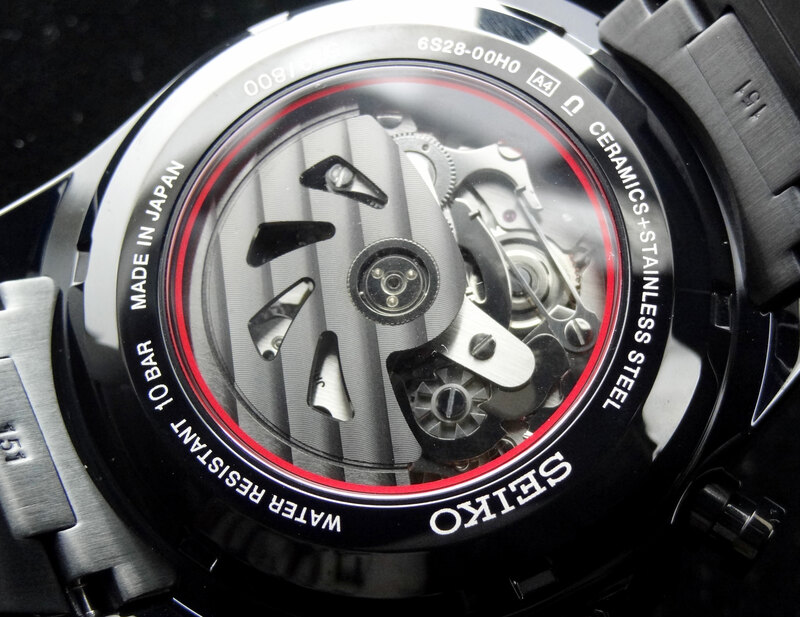 Aside from the beautifully crafted movement, the exterior of the watch is also exquisite. The case is hand polished and has a very impressive finish. 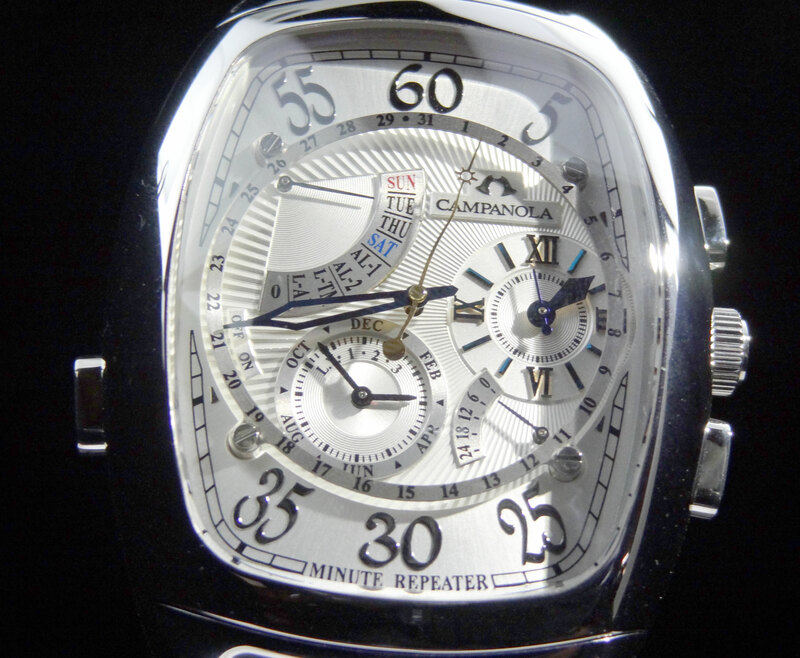 The anti-reflective coated sapphire crystals are thick and domed, giving an immense amount of depth to the dial. The dials themselves are also incredible. Some are embossed sunburst, pin stripe or wave type patterns and others are hand lacquered all done by one lacquer craftsman. The amount of detail you will find on these is uncanny. 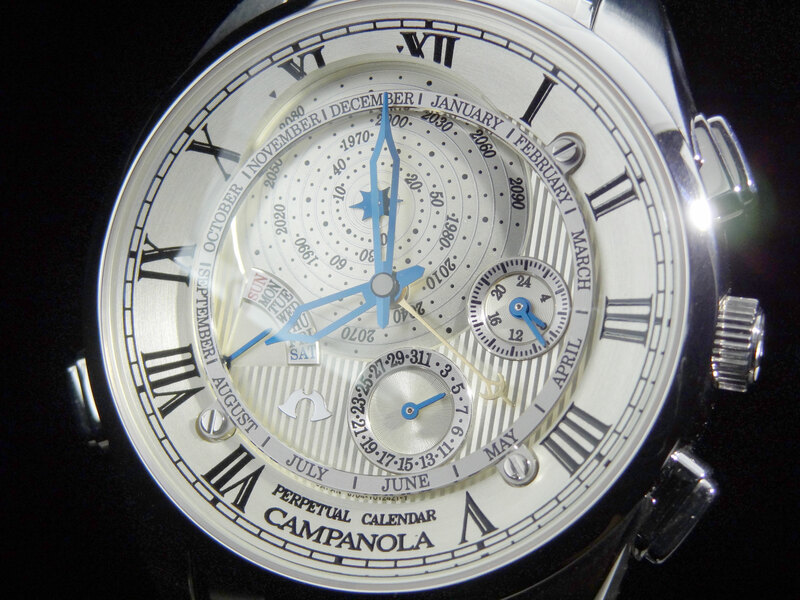 There is much time, labor and love put into Campanola. If you tried to find all of these great features in a mechanical watch, it could easily be well over $100,000 and it would more than likely have to be sent to the manufacture to be reset (which would take forever and also cost a fortune). This is what makes Campanola so great! Retailing from $2,000-$3,500 and not needing to be worn or wound to keep it going makes them incredibly valuable. The watch only needs to be set once, it will have accurate time, and will always know the appropriate day, date, month, year and leap year until the next battery change. Very Impressive to say the least. 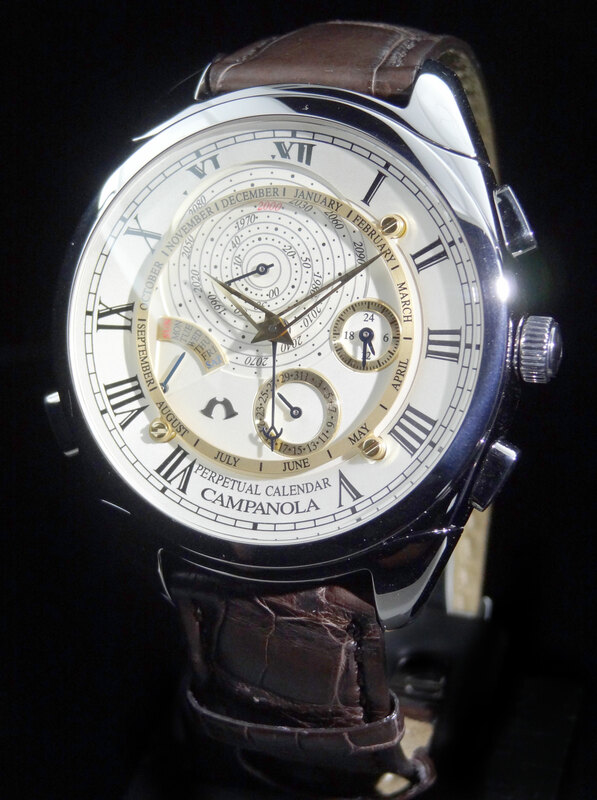 Campanola is an incredible and beautiful collectors piece. To find out more about this once in a lifetime opportunity, please call us at 1-800-486-3996 and mention reading it on the AZ Fine Time Blog for our best offer. Quantities are limited and it’s going to be hard to pass up. 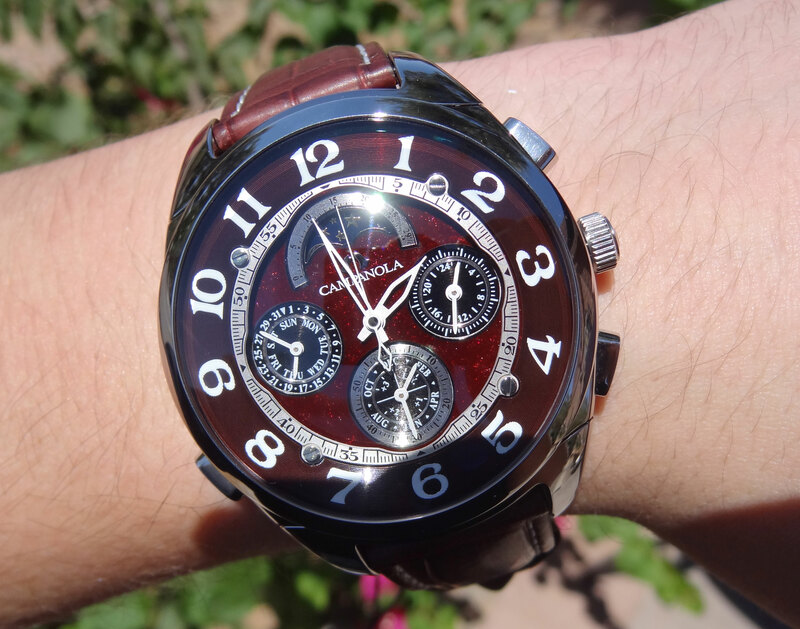 Now I think it’s time to add a new timepiece to my collection! 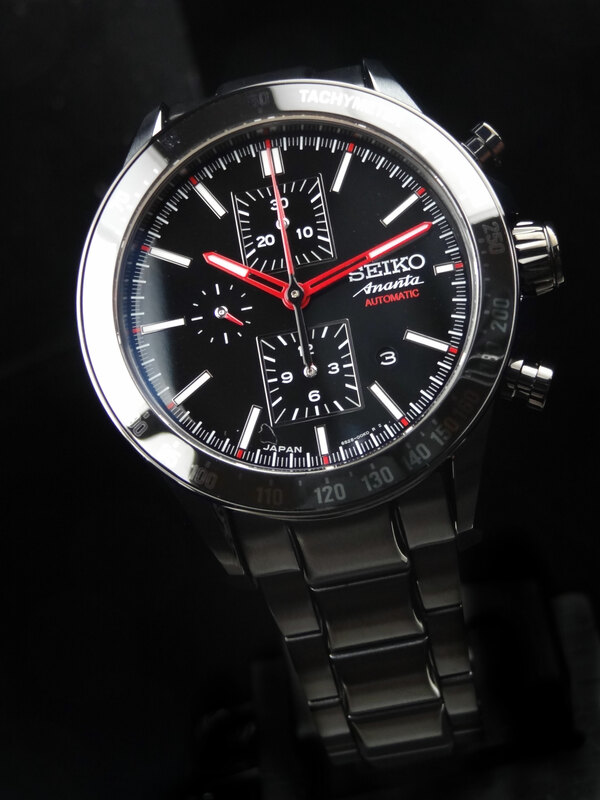 Seiko has an impressive reputation when it comes to automatic chronographs. In fact, they may have even been the 1st to release a self winding chronograph wrist watch back in May of 1969 with the 6139 movement. Today at AZ Fine Time, we are very proud to bring you Seiko’s latest in mechanical chronographs, the limited edition Ananta SSD001. The SSD001’s design is inspired by Japanese architecture, using simple straight lines to form the sub-dials for the chronograph. This style display was originally found in the vintage Seiko 5 Speed-Timers, and while this piece does pay some tribute to them, it is a far more modern design. The dial itself is hand lacquered by Japanese artist Mr Isshu Tamura, who also did last years Ananta SRQ013 Limited Edition. 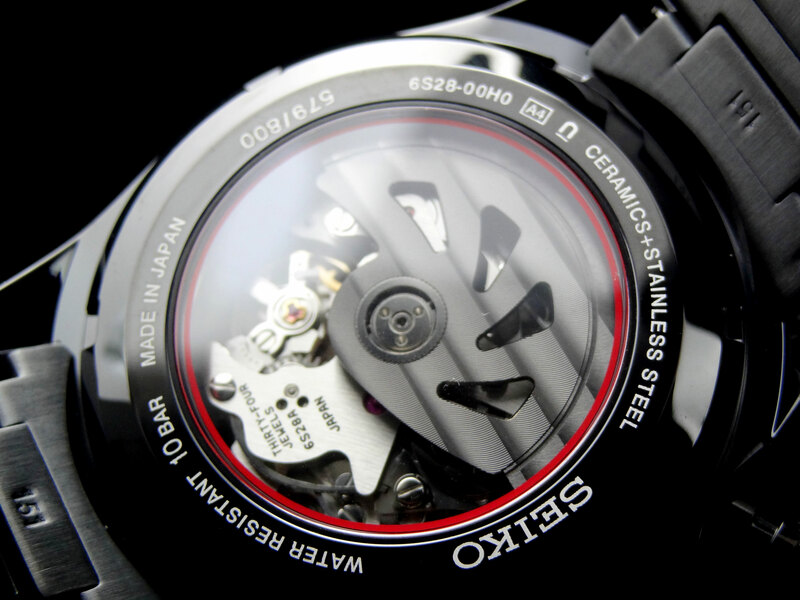 The lacquer makes the dial jet black and makes everything else on the face “pop” that much more. The hands are a very vibrant red, which makes legibility very easy. The white indices and markings are also very clear and appear as if they are floating over the lacquer from a top view. If you look from the side you can see that they are not, but still a cool visual effect. The all black hard coated 43mm case and bracelet are a great combination of brushed and polished finish and compliment the black Maki-E lacquer dial perfectly. 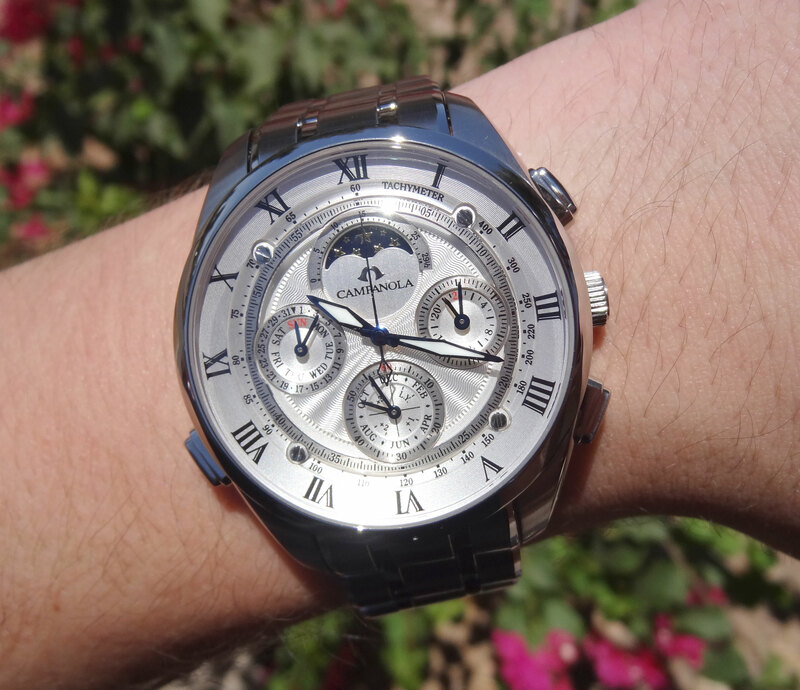 The bezel has a “ghost” type tachymeter that is very subdued, but still legible. The best part is that the bezel is indeed a ceramic insert. It’s high gloss is another perfect compliment to the hand lacquered dial. The 6S28 is the 1st time a 6S movement has ever become available to the US. While the 6S37 was very popular, it was only available in the Asian market. The 6S28 construction is an impressive layout and slightly thinner compared to other automatic chronographs (even though the case is still 15mm thick). This movement consists of 289 parts and 34 jewels. 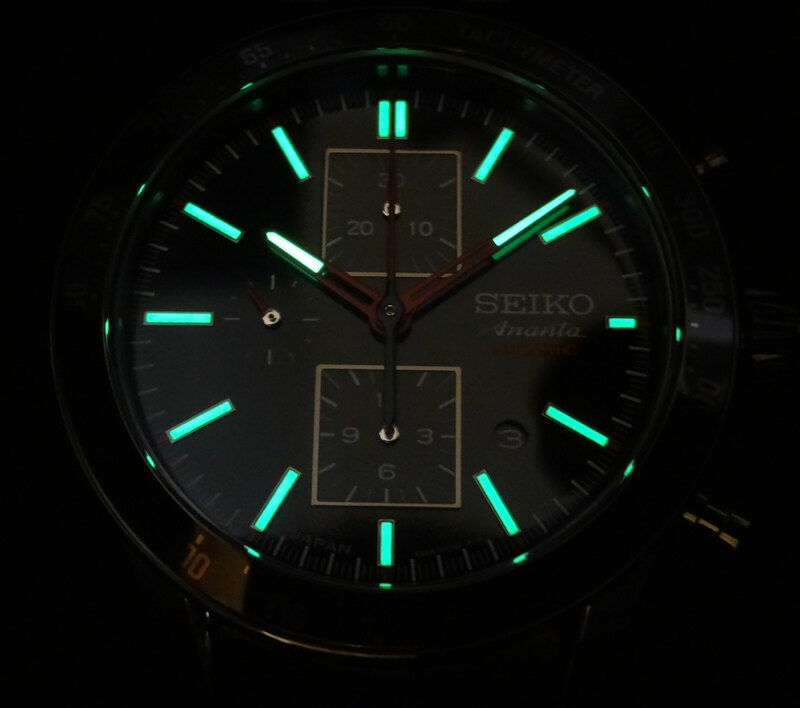 The lume is also spectacular especially considering it looks to be thin. 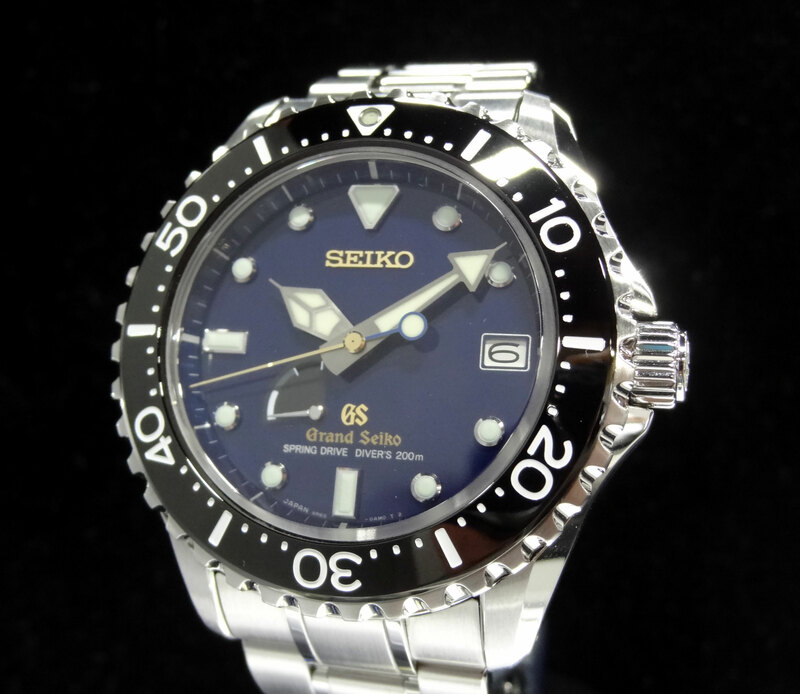 Luckily, Seiko’s Lumibrite is very strong and can emit light 5-8 hours off of 10 minutes under regular inside lighting. The SSD001 is limited to only 800 pieces produced. Retail is $5,400. 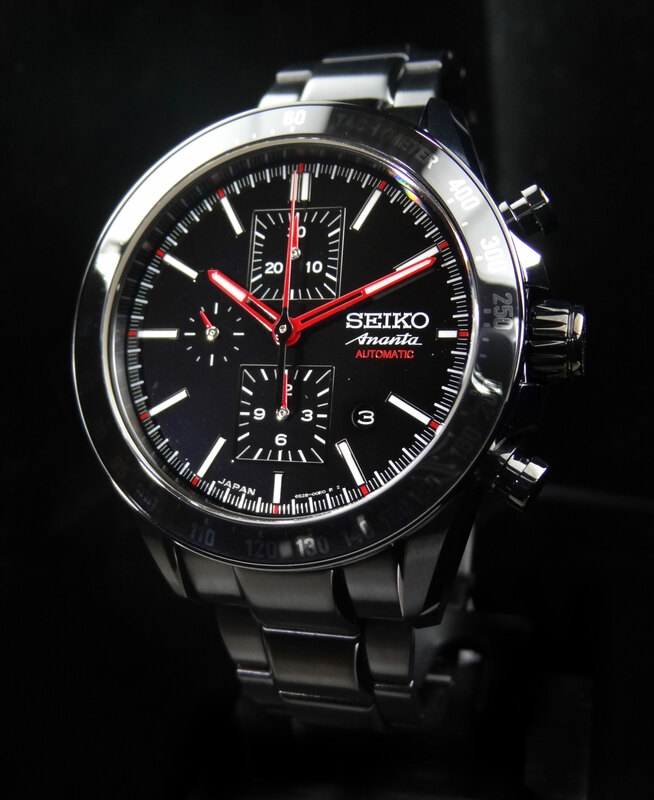 Another great addition to the line up from Seiko. I hope you enjoyed the read and the pictures. Please see all the images below. 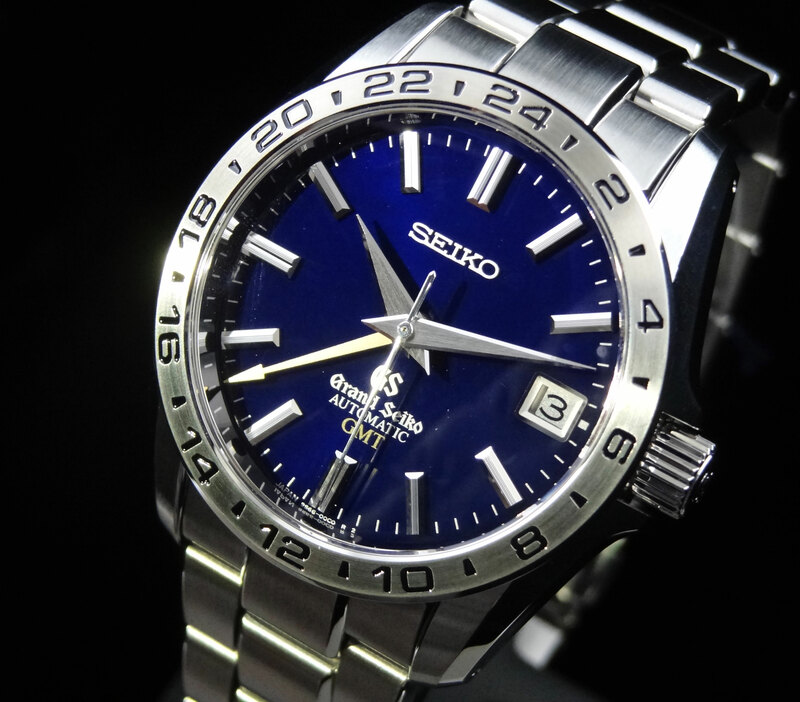 2012 commemorates the 10th Anniversary of the 1st Grand Seiko to posses a fourth hand, displaying GMT time. 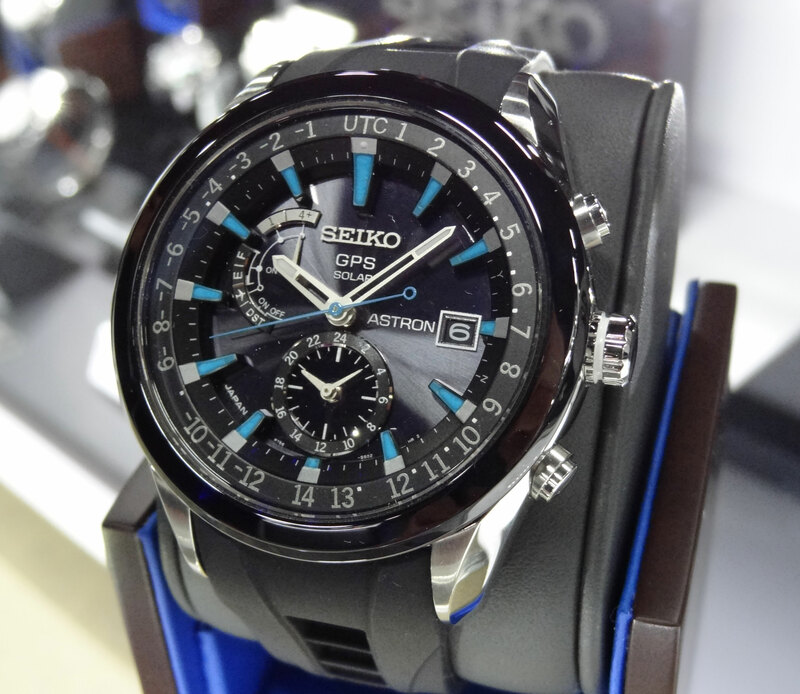 To honor this achievement, Seiko has released 2 Limited Editions. One, SBGM031 to pay tribute to SBGM003 (leather strap) and another SBGM029 to honor SBGM001 (bracelet). Today, Arizona Fine Time has received the 1st small allotment of the new SBGM029, and much earlier than anticipated. Arrival for these exquisite time pieces was originally planned for October. Luckily, production was completed early and AZ Fine Time was one of the 1st to receive them in the US. I am very happy to share this commemorative piece for the 1st time with pictures of it in the metal. The design of the SBGM029 replicates the SBGM001 (the 1st GS GMT), with a few new changes. 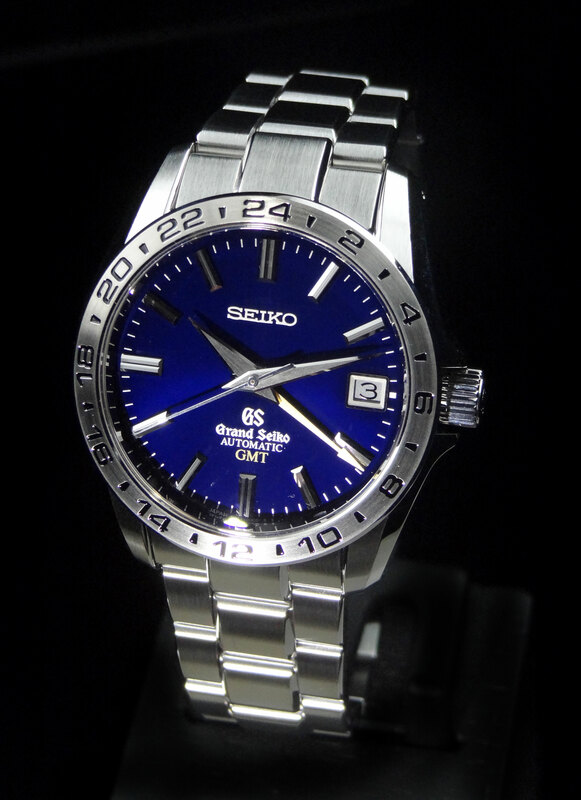 The dial is a gorgeous deep blue with gold GMT hand, boasting the official Grand Seiko colors. 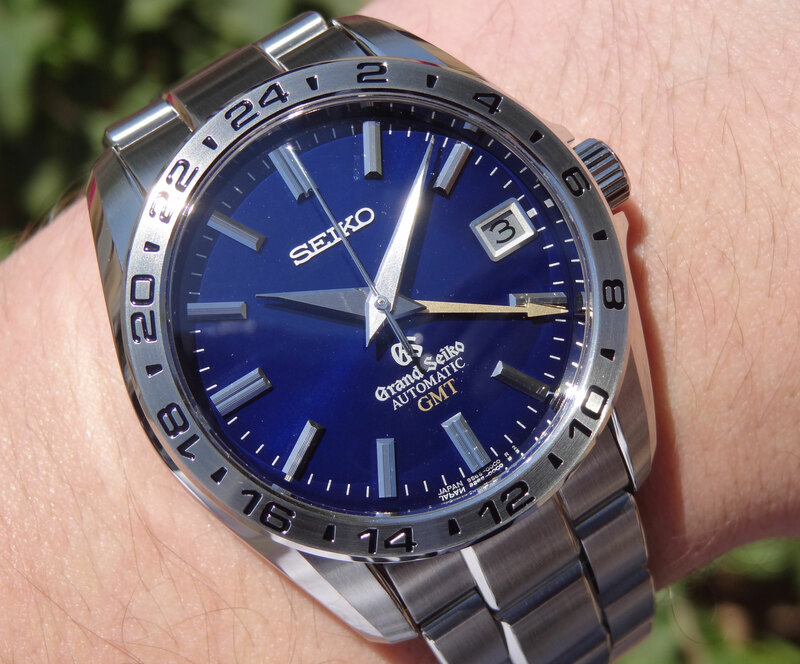 This is the 1st time a Grand Seiko mechanical GMT has ever been exhibited with a blue dial. The blue dial is incredibly executed, with a pretty vast range of hue. 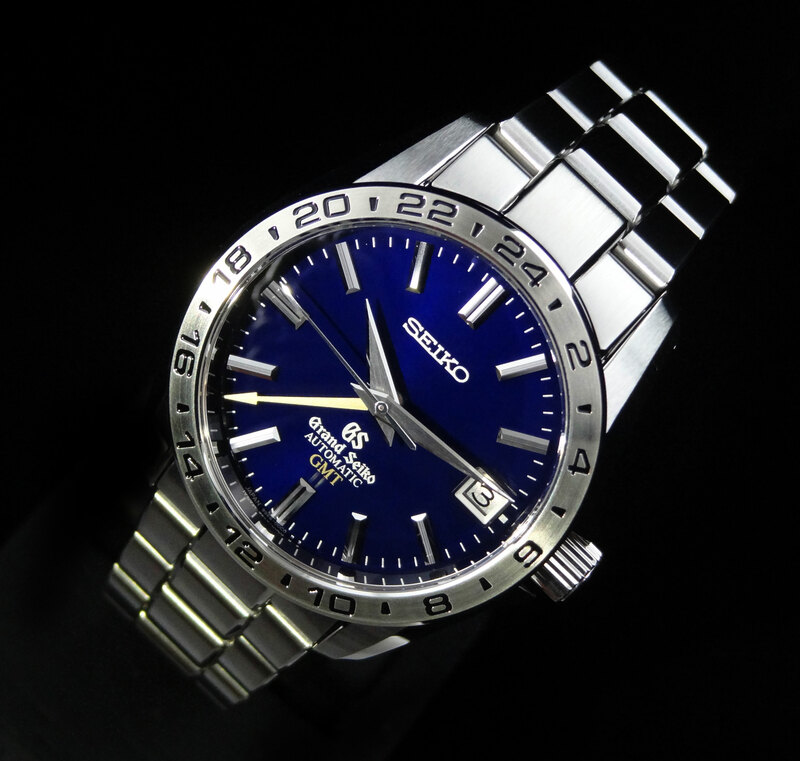 In bright lit settings, the dial is obviously a rich royal blue. Take it to a slightly darker room and it deepens to a navy blue. In a fairly dark setting, the dial looks black. The nice part of the dial, is that you can get the range of all three shades, depending on the angle you look at the watch. As you will see in some of the pictures, the dial almost appears to be a gradient from certain angles. 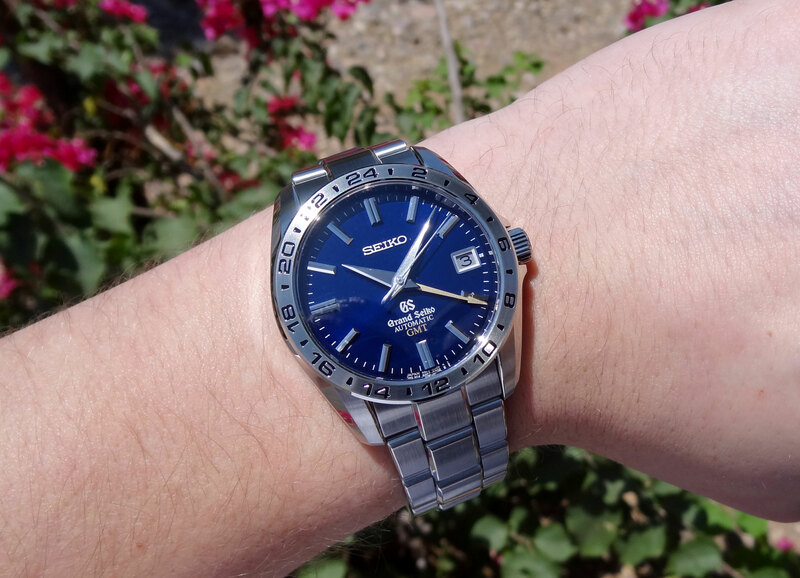 Seiko has done a tremendous job (as they usually do) making the dial more than it appears. The gold GMT hand has perfect contrast and compliments the blue perfectly. 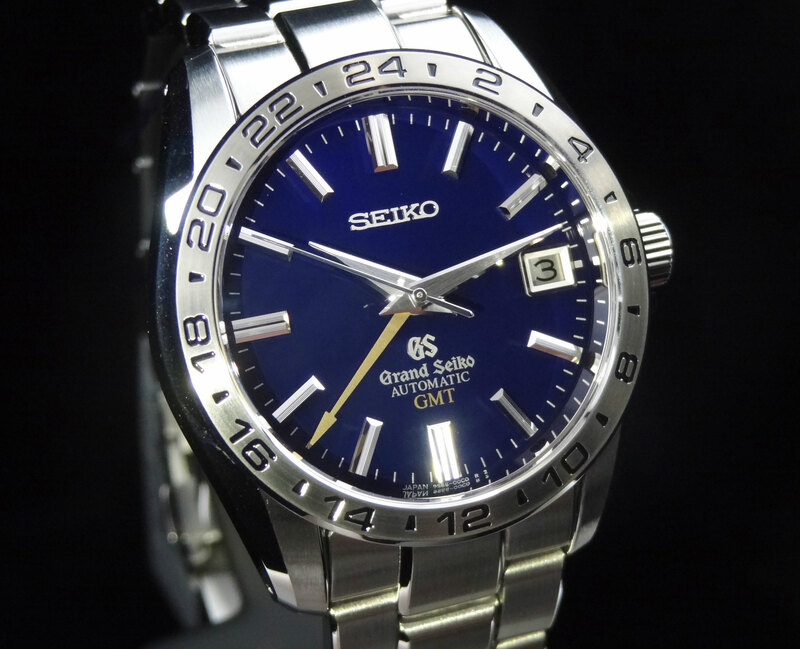 Legibility is a key element to Grand Seiko and this watch lives true to the tale. The combination of brushed and Zaratsu polished hands and markers only add to the legibility. Even in dark settings, the non-luminescent timepiece will be legible. The polished aspects reflect the most minimal amounts of light giving near an outline of the hands and indexes. The more broad brushed attributes show contrast over the dark dial, so the hands and indexes do not reflect more of the night sky. If the hands were fully polished and reflecting the dark, the hands would show no contrast to the dial and make it near impossible to read. 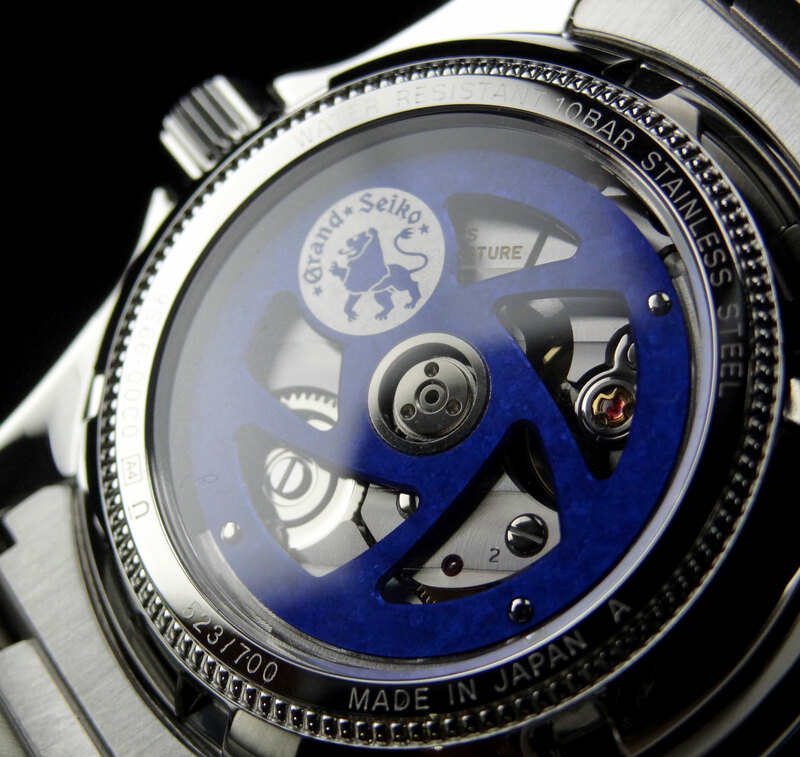 One of my favorite parts on this piece (as well as on any Grand Seiko) is the movement. Seiko has taken the impressive 9S66 movement with 35 jewels, Spron 610 hairspring (for supreme durability and elasticity), and Spron 510 mainspring (for 72 hr power reserve as well as supreme durability and elasticity) and added something special to this commemorative Limited Edition. The oscillating weight of the SBGM029 takes up near the entire case back is made of titanium, making the watch more resistant to corrosion and shock. The titanium can actually absorb 10 times the shock of the more commonly used brass, which will help in the prevention of movement damage if the piece is dropped. Because the rotor is so lightweight and so large, one side is weighted with tungsten to ensure the rotor moves effortlessly. 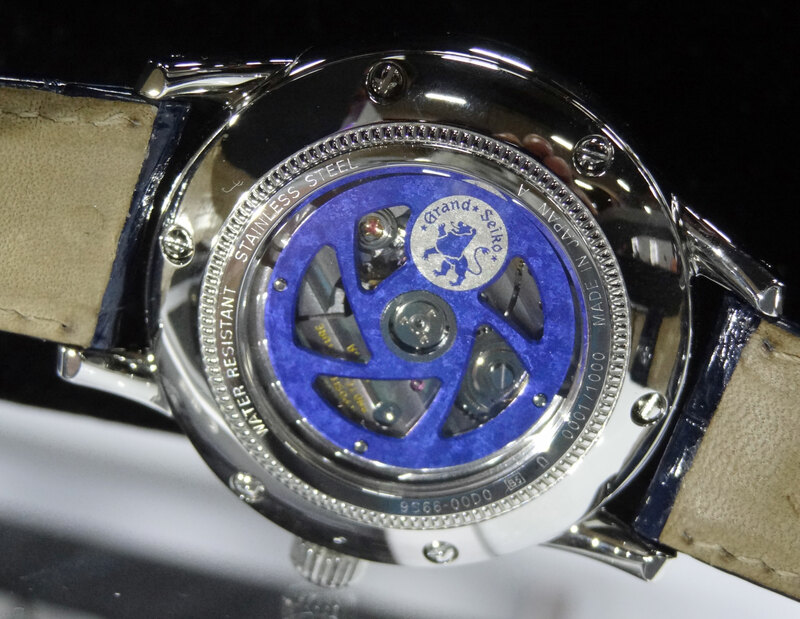 The case and bracelet are the exact duplicate as the SBGM001. 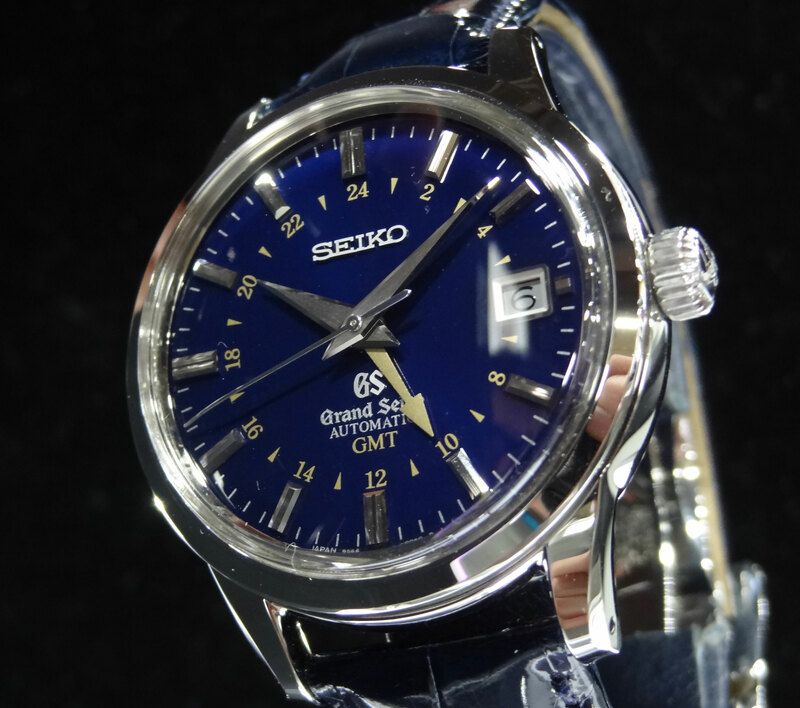 Because Grand Seiko has only been available in the US only 2 years, I never had the opportunity to see the original SBGM001. Now, after seeing the SBGM029 in person, I know why there was so much admiration for the 001. It is a beautifully constructed design. The 39.2mm case is a perfect size and shape, curving nicely to the wrist. The engraved bezel looks spectacular. Very detailed and precise. The bracelet fits very comfortably and is built solid. I like that the bracelet is mostly brushed, which will help hide signs of wear. 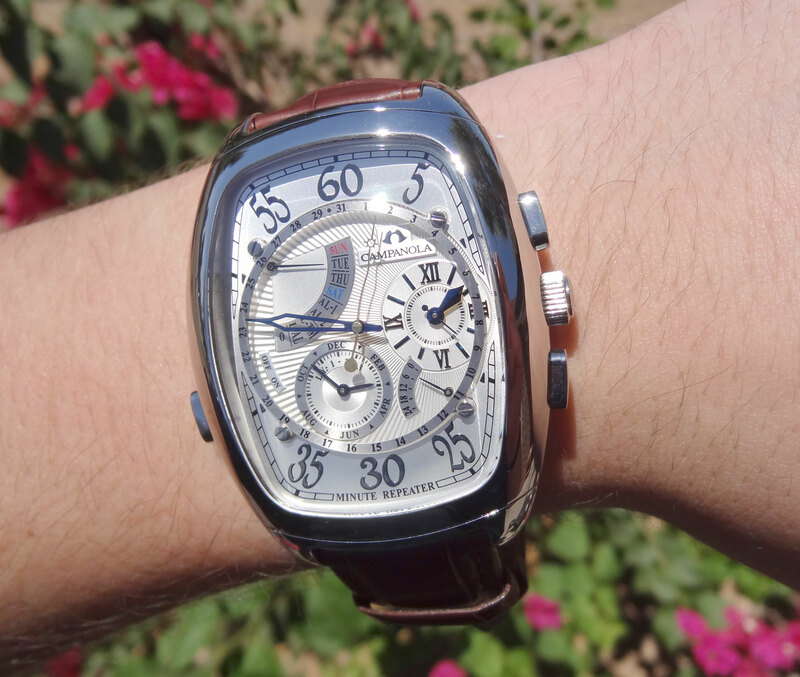 Overall, the SBGM029 is a truly gorgeous and collectible timepiece. Only 700 were made and will surely sell out fast. This is a piece that I would love to add to my collection, and I’m sure many others out there would agree. Retail on this piece is $6,700 . I hope you enjoyed the read and pictures. Please stay tuned for the delivery of SBGM031 at the end of August. 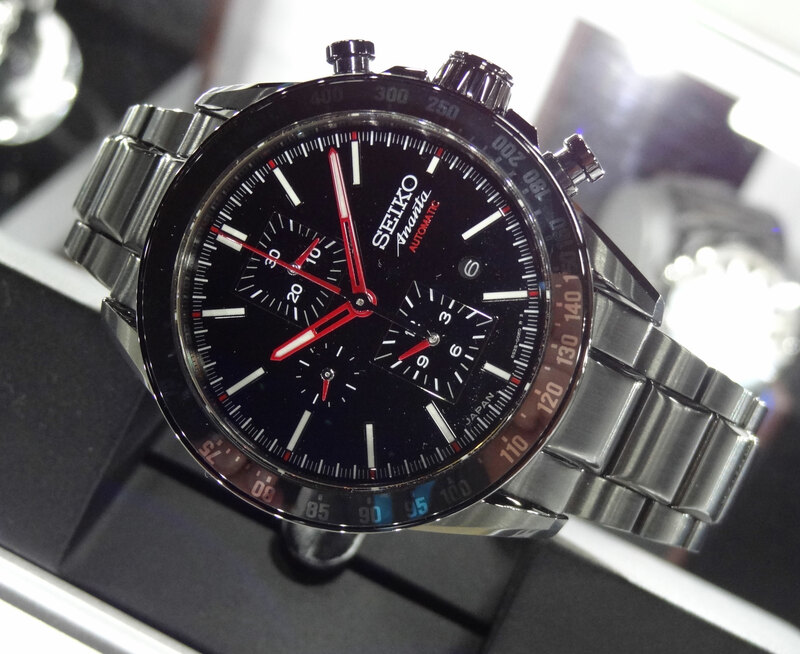 At this years Basel Fair, Seiko introduced a number of very interesting items. We were sure to share all the information (and pictures) we had at the time. Recently at the JCK watch and jewelry show, we had the opportunity to re-visit some of this years introductions before their US release this fall. 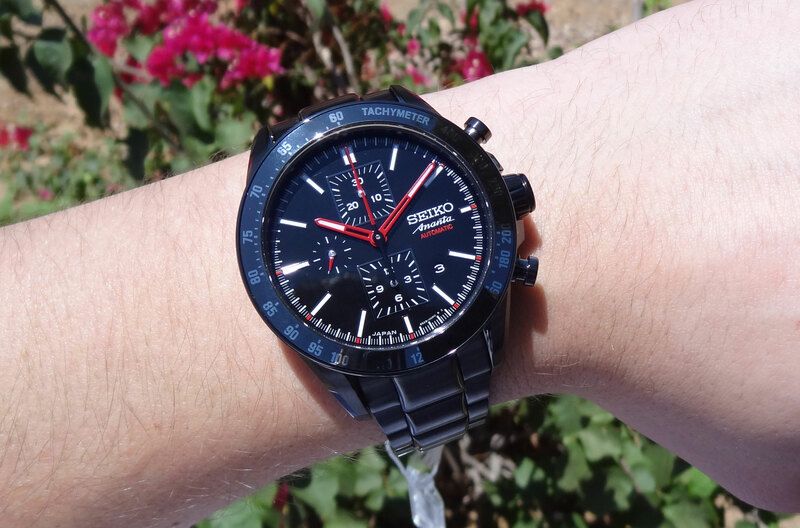 One of Seiko’s most popular releases this year was the new Seiko Astron GPS Solar. This timepiece is the 1st solar powered watch to receive updates from up to 4 GPS satellites to update accuracy, date and (most importantly) location. 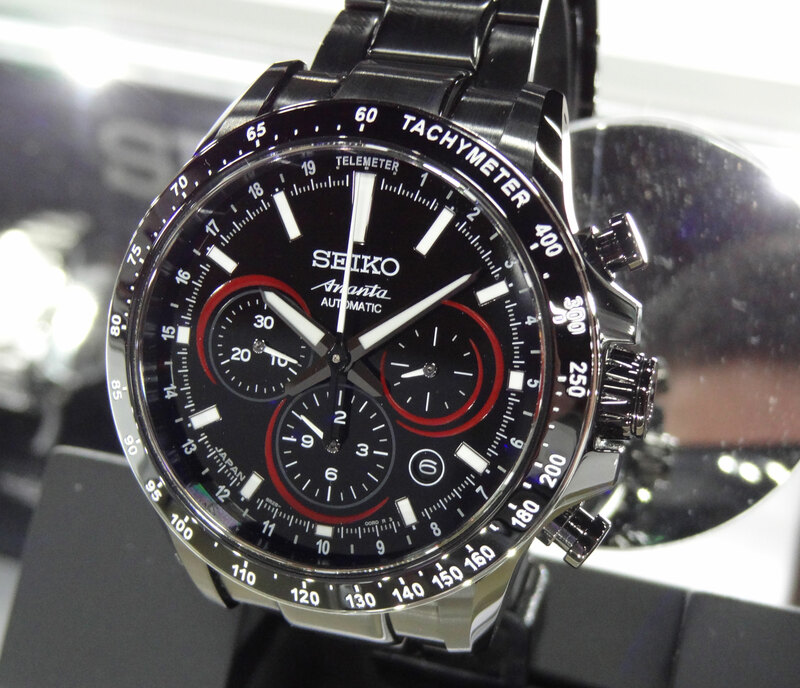 At the push of a button the Seiko Astron GPS will update your watch to display the time in whatever current timezone you are in. All have the quality build of Seiko Ananta for the case and bracelet, ceramic bezels and a sleep mode function that will allow the piece to go 3-4 years in the dark before running out of power. 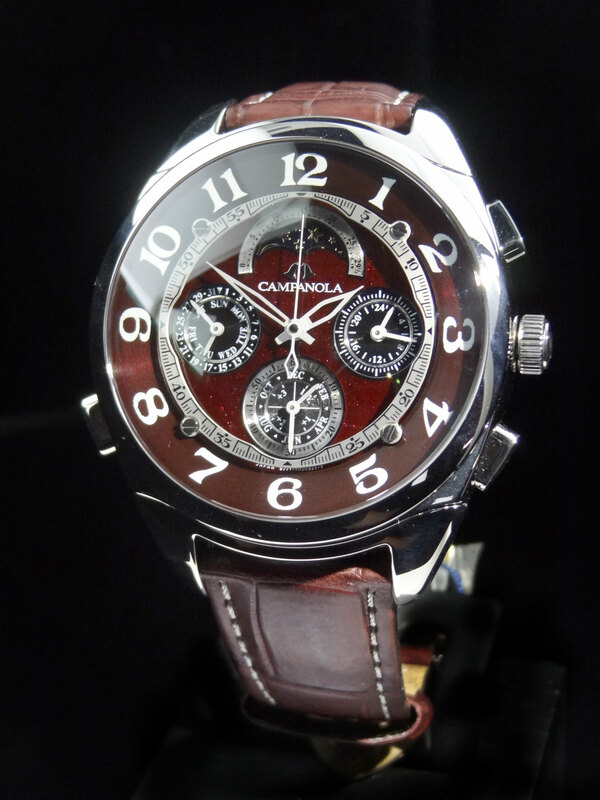 Prices will start at $2,300 retail (SAST009-pictured below) up to $3,850 (SAST001 Limited Edition of 2,500). 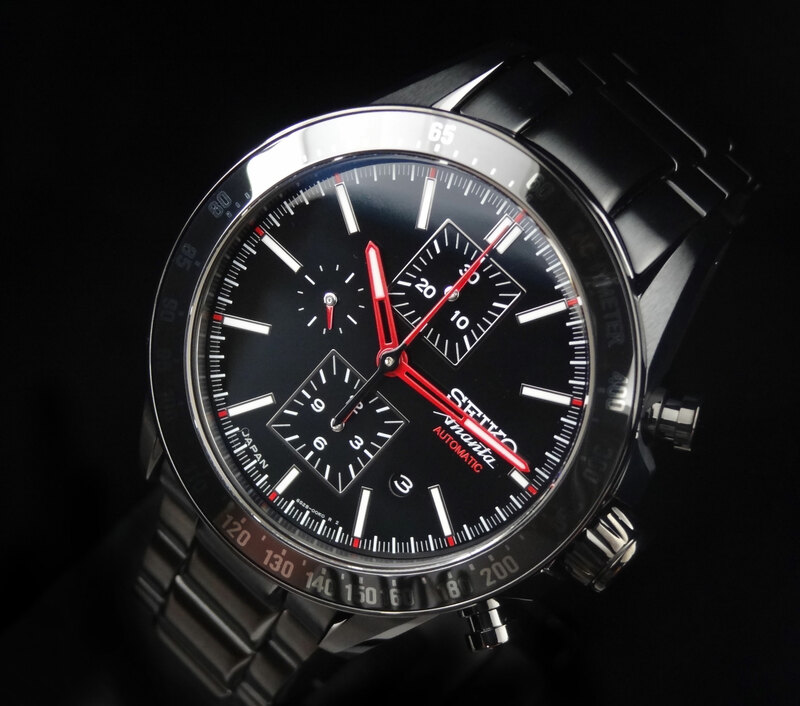 Seiko Ananta introduced 2 new hand painted black lacquered dials this year. 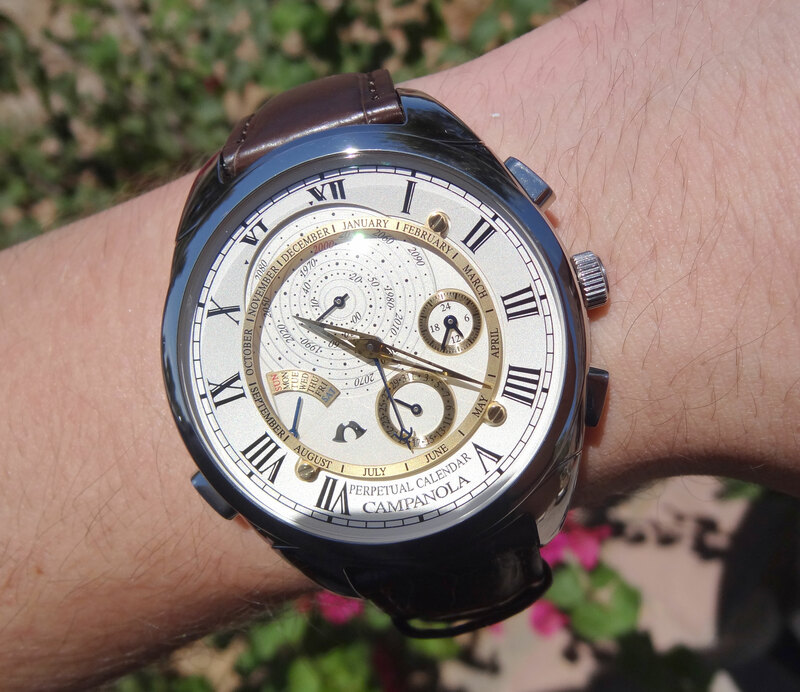 One being SRQ015 Kumadori which uses the 8R28 movement found in most Ananta. Kumadori is the name for the face paint worn by Japanese kabuki actors, in which the red striping indicates the powerful hero role. 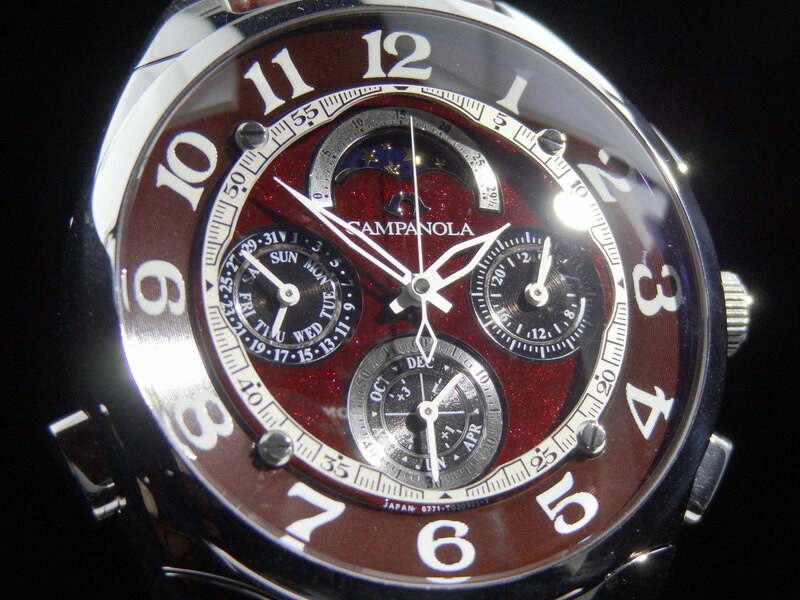 You will see this characteristic in the dial of the Ananta, with the red striping surrounding the chronograph subdials. This piece will be limited to 800 pieces and retail for $5,000. The second version of Ananta to come out with the hand painted black lacquer dial is the all new SSD001. This model introduces the 6S28 movement. The movement derives from the very popular 6S37, does not have a power reserve display, but does boast a 50 hour power reserve. This is the 1st time a 6S movement has been released to the US market. 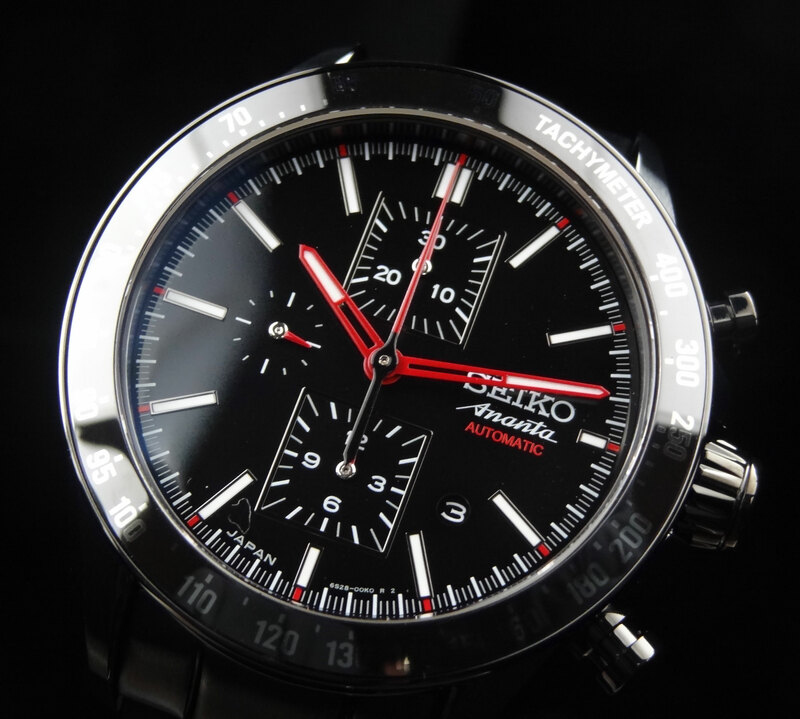 The squared subdials pay tribute to the 1970’s Seiko 5 Speedtimer, with the modern twist of black coating to the case. There will be only 800 produced and retail will be $5,400. 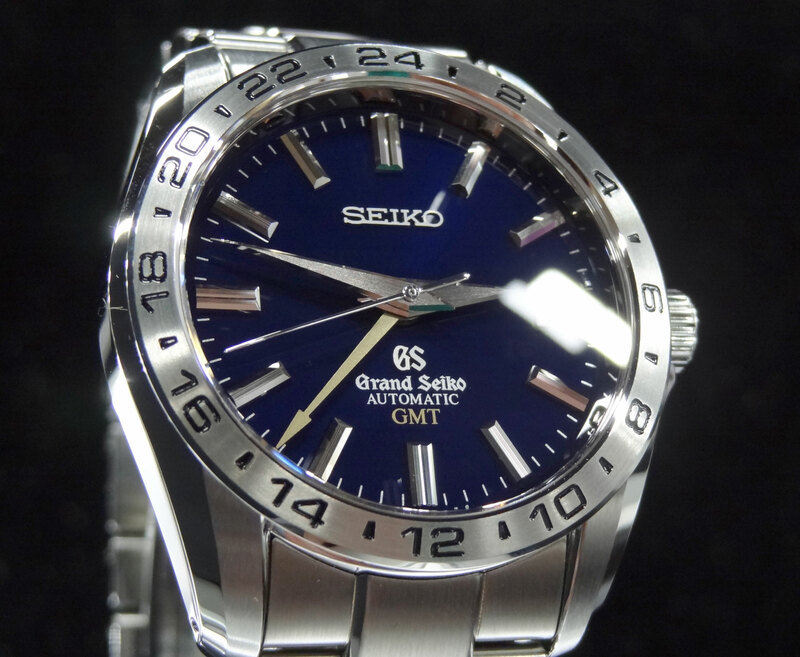 This years celebrates the 10 year anniversary for the first Grand Seiko with a GMT function. 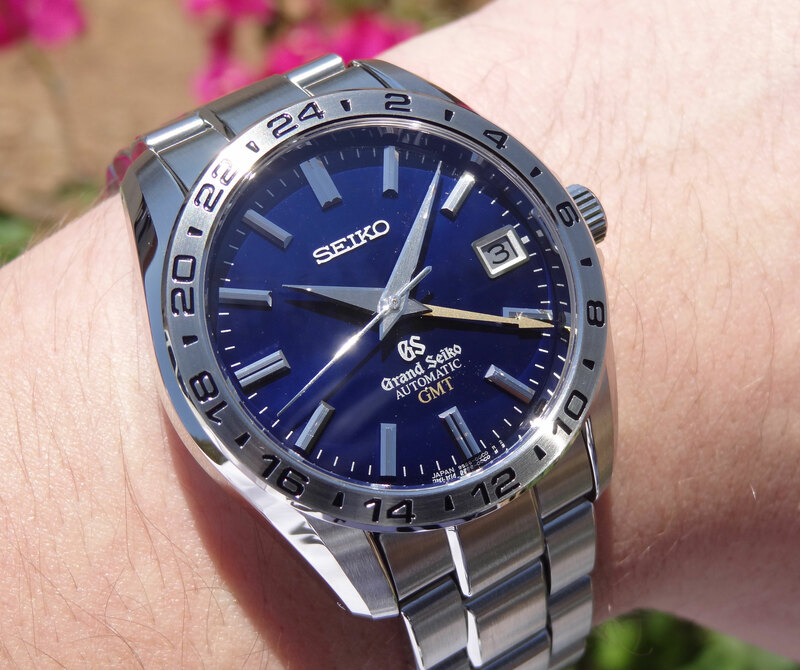 To honor this achievement, Seiko will be releasing 2 variations of Limited Editions, each with the beautiful GS deep blue dial and gold GMT hand. SBGM029 (bracelet) will be limited to only 700 pieces and retail for $6,700. SBGM031 (strap) will be limited to only 1,000 pieces and retail for $6,300. Both pieces use the 9S66 movement, but modified with a new titanium rotor with tungsten weight, only available in this limited edition. With almost no information available on this next piece, it is incredibly popular. The new Grand Seiko Diver Limited Edition SBGA071 will be limited to only 150 pieces world wide. This model uses the same deep blue on the new GMT limited pieces and has a gold and blue second hand. It is a stainless steel case and bracelet with diver expansion clasp. US retail is going to be $8,000. These will certainly sell out in no time. All of these products are due in October. We would like to formally announce that AZ Fine Time, will once again, be hosting the Grand Seiko Roadshow Friday October 26th to launch the debut of these amazing timepieces!